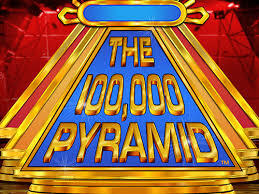 You need to know that The $100,000 Pyramid is a reboot of the classic game show that pairs contestants with celebs to answer quiz questions and win money. It occasionally features some tongue-in-cheek boasting by celebs, plus quippy sexual innuendo, some of which will go over kids&apos; heads. Disney is often mentioned, and brands such as Ikea, Viagra, and others are randomly brought up during the game. Like the original, it&apos;s a harmless and fun game show that families with tweens should enjoy. Hosted by Michael Strahan, THE $100,000 PYRAMID is a revival of the popular classic game show of the same name. Each episode features two celebrities, each pairing up with a contestant and facing off in a word-association game, during which they must get as many correct answers as possible within a small amount of time. The team to get the most in the first round makes it into the "winner’s circle" to play for $50,000. After the celebs switch partners, they go through the process again. If the contestant makes it into the circle a second time, they play for the $100,000 prize. This lighthearted competition offers tons of fun-filled suspense as celebrity guests such as Rosie O’Donnell and Anthony Anderson boast, joke, and attempt to help their partners win some cash. Also, there are lots of humorous mishaps that occur as they frantically try to beat the clock. Despite some mildly modern twists, such as featuring straps on chairs so people don&apos;t move their hands in the winner&apos;s circle, fans of the classic show will find themselves loving the game the same way they did years ago. But it&apos;s likely that this rendition will recruit a new generation of appreciative viewers.